We believe Juniors are the future of the dog sports. For juniors who competitively compete in AKC/ASCA we price our pups lower. Junior showmanship has been such a positive influence in our lives and we would like to give back to the sport. If we dont have what your looking for we have friends who have puppies and older dogs available. Please feel free to call us and we'd be happy to direct you to them. When matching puppies with their future owners we try to match the puppies’ personality to the role it will play within its new family. When deciding what puppies will be available we will not make final decisions until puppies are 8 weeks old and puppies have been evaluated. 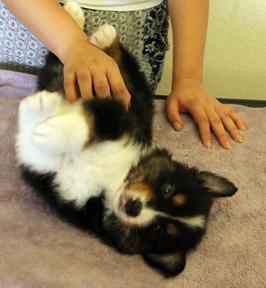 We evaluate for overall health, structure, temperament and movement. Puppies will be seen by a certified ophthalmologist before leaving for their new homes. Puppies will also receive their first shot and be dewormed at least twice. Puppies will not leave for their new homes until they are 8 weeks old. Puppies will come with a 3 year health guarantee. Health is VERY important to us and all of our breeding dogs hips are OFA'd and eyes are CERF clear yearly. 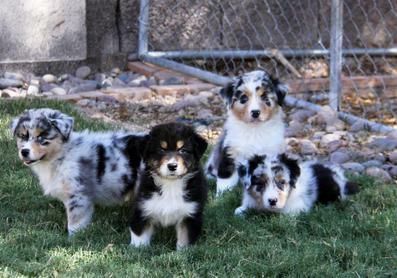 We may occasionally have an adults or older puppies for sale. The older adults are usually retired show dogs. Older puppies are puppies that we held back to watch grow but we feel will not do well in the show ring. All dogs are socialized, house broken, and up to date on their shots. Most puppies are sold with Spay/ Neuter Contracts. This guarantees the dog/puppy are free of hereditary defects and make great companions. Dogs/puppies sold with this type of contract are not suitable for breeding but may do well as performance dogs. 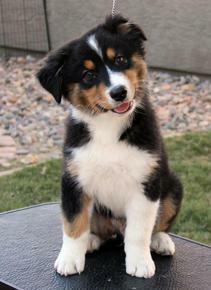 (Obedience, agility, herding, tracking, and/or rally). Owners will receive Limited Registration papers. Intact dogs/puppies are sold on an individual basis. We do not sell puppies to homes where the sole purpose is breeding. These dogs/puppies are sold intact to show/breeding homes are free of disqualifying faults and hereditary defects. We do not guarantee the dog will receive a title but we feel that it is acceptable for the show ring. Show and Juniors homes are given preference. All transportation costs will be the responsibility of the buyer. Any dogs/puppies listed here are currently available. We update our website regularly. If your interested in a puppy from a future breeding click the link below to join our waiting list. We will get back with you and let you know our future litter plans.